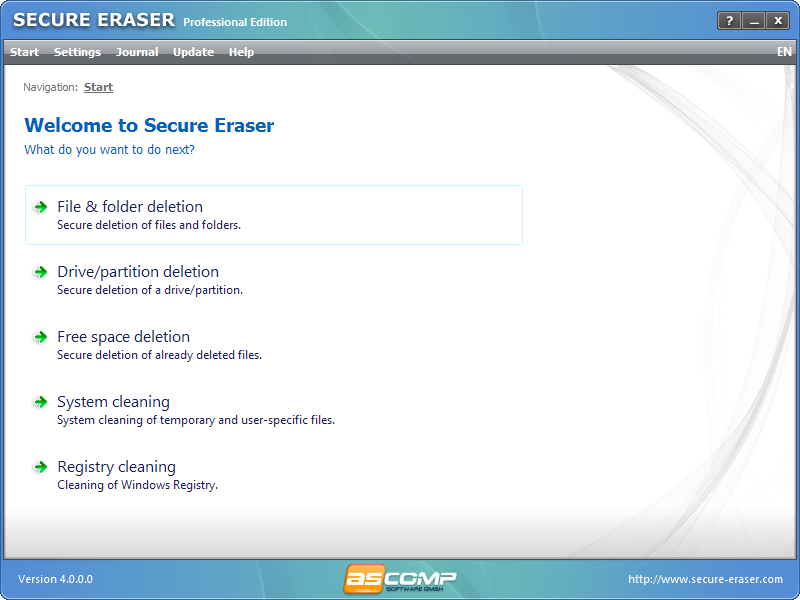 Applying five well-known and acknowledged deletion standards Secure Eraser deletes your sensitive data irretrievably - and offers an easy to use user interface. Additionally to overwriting sensitive files with random data Secure Eraser supports other acknowledged deletion standards such as US DoD 5220.22-M ECE, German standard and Peter Gutmann standard - and offers several system and Windows Registry cleaning options either. Software for secure file and drive deletion on Windows systems. Additionally to overwriting sensitive files with random data Secure Eraser supports other acknowledged deletion standards (US DoD 5220.22-M E, US DoD 5220.22-M ECE, German standard, Peter Gutmann standard). Secure Eraser creates context menu entries in context menus for files, folders and recycle bin to allow direct access to secure file deletion functions. Secure file transfer client with advanced automation and configuration options. Disk wiper tool can wipe private confidential data and information permanently. Max PC Secure is an advanced Securty tool for Windows. Secure IE 2004 - Stop Hackers in Their Tracks! Wiperaser is a secure data deletion tool. Unrecoverably wipe files and folders. Qweas is providing links to Secure Eraser 4.0 as a courtesy, and makes no representations regarding Secure Eraser or any other applications or any information related thereto. Any questions, complaints or claims regarding this application Secure Eraser 4.0 must be directed to the appropriate software vendor. You may click the publisher link of Secure Eraser on the top of this page to get more details about the vendor.